[S28] James Alonzo Matthews, Jr. and Lucille Pearce, comps., Pearce, Bartlett, Matthews, Smart, and Allied Families (Austin, Tex. : Eakin Publications, Inc., 1983), p. 180 (naming Edwin Leroy Driggs as her father). [S28] James Alonzo Matthews, Jr. et al., Pearce [etc.] and Allied Families, above, p. 180 (naming Josephine Denira Jackson as her mother). [S28] James Alonzo Matthews, Jr. et al., Pearce [etc.] and Allied Families, above, p. 180. [S28] James Alonzo Matthews, Jr. and Lucille Pearce, comps., Pearce, Bartlett, Matthews, Smart, and Allied Families (Austin, Tex. : Eakin Publications, Inc., 1983), p. 180 (naming Edwin Leroy Driggs as his father). [S28] James Alonzo Matthews, Jr. et al., Pearce [etc.] and Allied Families, above, p. 180 (naming Josephine Denira Jackson as his mother). [S312] Social Security Death Index, online at http://tinyurl.com/AncestrySSDI, viewed on 31 Oct 1998. [S312] Social Security Death Index, online at http://tinyurl.com/AncestrySSDI, viewed on 31 Oct 1998 (not naming the place of death but stating that he lived in Novato, California when he died). [S28] James Alonzo Matthews, Jr. and Lucille Pearce, comps., Pearce, Bartlett, Matthews, Smart, and Allied Families (Austin, Tex. : Eakin Publications, Inc., 1983), p. 180. [S28] James Alonzo Matthews, Jr. and Lucille Pearce, comps., Pearce, Bartlett, Matthews, Smart, and Allied Families (Austin, Tex. : Eakin Publications, Inc., 1983), p. 180 (naming Nixon Fullerton as her father). [S28] James Alonzo Matthews, Jr. et al., Pearce [etc.] and Allied Families, above, p. 180 (naming Helen Clark as her mother). [S28] James Alonzo Matthews, Jr. et al., Pearce [etc.] and Allied Families, above, p. 180 (naming Margaret Nixon Fullerton as his mother). [S28] James Alonzo Matthews, Jr. et al., Pearce [etc.] and Allied Families, above, p. 180 (naming Margaret Nixon Fullerton as her mother). [S28] James Alonzo Matthews, Jr. et al., Pearce [etc.] and Allied Families, above, p. 180 (naming Nixon Fullerton as her father). [S28] James Alonzo Matthews, Jr. and Lucille Pearce, comps., Pearce, Bartlett, Matthews, Smart, and Allied Families (Austin, Tex. : Eakin Publications, Inc., 1983), p. 180 (naming Francis Bell Hunt as his father). [S28] James Alonzo Matthews, Jr. and Lucille Pearce, comps., Pearce, Bartlett, Matthews, Smart, and Allied Families (Austin, Tex. : Eakin Publications, Inc., 1983), p. 180 (naming Francis Bell Hunt as her father). [S28] James Alonzo Matthews, Jr. and Lucille Pearce, comps., Pearce, Bartlett, Matthews, Smart, and Allied Families (Austin, Tex. : Eakin Publications, Inc., 1983), p. 180 (naming James B. Sexton as her father). [S28] James Alonzo Matthews, Jr. et al., Pearce [etc.] and Allied Families, above, p. 180 (naming Alice May Sexton as her mother). [S28] James Alonzo Matthews, Jr. et al., Pearce [etc.] and Allied Families, above, p. 180 (naming Alice May Sexton as his mother). Marriage*: She married James B. Sexton. [S28] James Alonzo Matthews, Jr. and Lucille Pearce, comps., Pearce, Bartlett, Matthews, Smart, and Allied Families (Austin, Tex. : Eakin Publications, Inc., 1983), p. 180 (naming John Peter Hunt as her father). [S28] James Alonzo Matthews, Jr. and Lucille Pearce, comps., Pearce, Bartlett, Matthews, Smart, and Allied Families (Austin, Tex. : Eakin Publications, Inc., 1983), p. 180 (naming John Peter Hunt as his father). [S28] James Alonzo Matthews, Jr. et al., Pearce [etc.] and Allied Families, above, p. 180 (naming Anna Christena Hunt as her mother). [S28] James Alonzo Matthews, Jr. et al., Pearce [etc.] and Allied Families, above, p. 180 (naming Anna Christena Hunt as his mother). [S28] James Alonzo Matthews, Jr. et al., Pearce [etc.] and Allied Families, above, p. 180 (naming Joe Nebel Reschly as her father). [S28] James Alonzo Matthews, Jr. et al., Pearce [etc.] and Allied Families, above, p. 180 (naming Joe Nebel Reschly as his father). [S28] James Alonzo Matthews, Jr. and Lucille Pearce, comps., Pearce, Bartlett, Matthews, Smart, and Allied Families (Austin, Tex. : Eakin Publications, Inc., 1983), p. 180 (naming Joe Nebel Reschly as her father). [S28] James Alonzo Matthews, Jr. and Lucille Pearce, comps., Pearce, Bartlett, Matthews, Smart, and Allied Families (Austin, Tex. : Eakin Publications, Inc., 1983), p. 180 (naming Joe Nebel Reschly as his father). [S1108] Social Security Death Index, online at http://tinyurl.com/RootswebSSDI, viewed on 4 Feb 2007 (stating that he died on 21 Aug 2005; not naming the place of death but stating that he lived in Kalona, Iowa when he died). [S28] James Alonzo Matthews, Jr. and Lucille Pearce, comps., Pearce, Bartlett, Matthews, Smart, and Allied Families (Austin, Tex. : Eakin Publications, Inc., 1983), p. 181. [S28] James Alonzo Matthews, Jr. et al., Pearce [etc.] and Allied Families, above, p. 181 (naming Mary Love as his mother). [S28] James Alonzo Matthews, Jr. et al., Pearce [etc.] and Allied Families, above, p. 181 (naming Mary Love as her mother). [S28] James Alonzo Matthews, Jr. and Lucille Pearce, comps., Pearce, Bartlett, Matthews, Smart, and Allied Families (Austin, Tex. : Eakin Publications, Inc., 1983), p. 181 (naming John Bartlett Hunt as his father). [S28] James Alonzo Matthews, Jr. et al., Pearce [etc.] and Allied Families, above, p. 181. [S28] James Alonzo Matthews, Jr. and Lucille Pearce, comps., Pearce, Bartlett, Matthews, Smart, and Allied Families (Austin, Tex. : Eakin Publications, Inc., 1983), p. 181 (naming John Bartlett Hunt as her father). [S28] James Alonzo Matthews, Jr. et al., Pearce [etc.] and Allied Families, above, p. 181 (naming Lois Hunt as her mother). [S28] James Alonzo Matthews, Jr. et al., Pearce [etc.] and Allied Families, above, p. 181 (naming _____ Pickerell as her father). [S28] James Alonzo Matthews, Jr. and Lucille Pearce, comps., Pearce, Bartlett, Matthews, Smart, and Allied Families (Austin, Tex. : Eakin Publications, Inc., 1983), p. 181 (naming _____ Pickerell as her father). 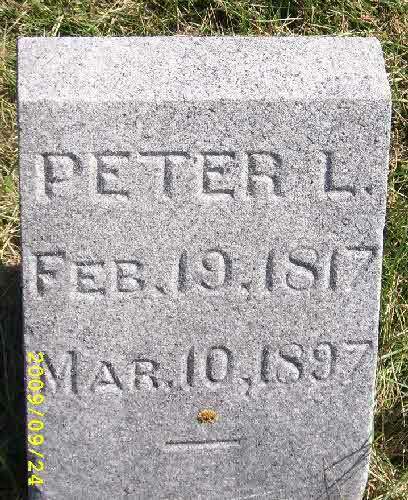 Peter L. DeLashmutt's tombstone, Glenwood Cemetery, Glenwood, Iowa, courtesy of Dennis Bell. [S854] David Haase, Selected Families and Individuals, online http://www.haase.org/pafg30.htm (naming Van William DeLashmutt as his father). [S854] David Haase, Selected Families and Individuals, online, above (naming Mary Ankrum as his mother). [S854] David Haase, Selected Families and Individuals, online, above. [S961] Find A Grave, online at http://www.findagrave.com, memorial for Esther DeLashmutt, memorial no. 42403892, viewed on 30 Jun 2011 (not giving the date). [S961] Find A Grave, online, above, memorial for Peter L. DeLashmutt, memorial no. 42404017, viewed on 30 Jun 2011 (not giving the date). [S961] Find A Grave, online, above, memorial for Peter L. DeLashmutt, memorial no. 42404017, viewed on 30 Jun 2011. [S1346] Mills County Tribune, Glenwood, Iowa, online at http://www.newspapers.com, 18 Mar 1897, p. 12, col. 6. [S28] James Alonzo Matthews, Jr. et al., Pearce [etc.] and Allied Families, above, p. 181 (naming Peter Lindsey DeLashmutt as her father). [S28] James Alonzo Matthews, Jr. et al., Pearce [etc.] and Allied Families, above, p. 181 (naming Peter Lindsey DeLashmutt as his father). [S961] Find A Grave, online, above, memorial for Lydia A. DeLashmutt, memorial no. 42403765, viewed on 30 Jun 2011 (naming Peter L. DeLashmutt as her father).